See also article about Black January (1990) with photos by Reza, the only international photojournalist who documented the event. Tehran--Reza was the only photojournalist on the scene when the U.S. Embassy in Tehran was taken over by so-called Islamic students. All the other correspondents were focusing on street demonstrations. Reza was the only one to witness the beginning of this incredible event. He spent the next 444 days outside the embassy, covering the developments and waiting for the crisis to end. 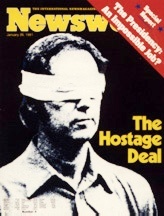 Reza's photos of American hostages made the front cover of numerous magazines throughout the world, including this Newsweek cover on January 26, 1981. Reza - it's his professional byline. Simply Reza - no last name. Unassuming, unpretentious, but at the same time, unforgettable - that's Reza, both in his character and in his photos. In earlier years, he could hide behind the anonymity of this first name. "Where I came from, 90 percent of the names have Reza in them-Ali Reza, Amir Reza, Mohammad Reza, Ahmad Reza, Mirza Reza," he explained. These days, however, Reza is known throughout the world for his photojournalism. Most recently, the byline "Reza" appears on photos in the prestigious National Geographic Magazine (USA). This is the same "Reza" that took the photos of blindfolded American hostages in Iran that appeared on the front cover of Newsweek magazine in 1981, an image that was seared into the memories of millions of Americans. Since then, the name "Reza" has appeared in some of the most prestigious news magazines and newspapers throughout the world - including Newsweek, Time, Life, New York Times (USA); Stern, Géo, Zeit and Der Spiegel (Germany); Match, Figaro, L'Express, Le Monde (France), Observer, Independent and Sunday Times Magazine (UK) and countless magazines, newspapers and newscasts all over the world. Left: Afghanistan--Guerrilla fighter resisting Soviet occupation, 1980s. 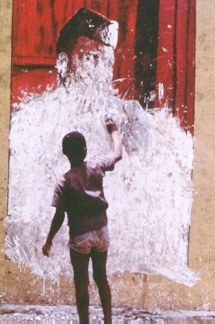 Right: Conakry, Guinea (West Africa) - Child scratching out the protrait of Ahmad Sekoutouroo, President and dictator for 25 years, on the occasion of his death. 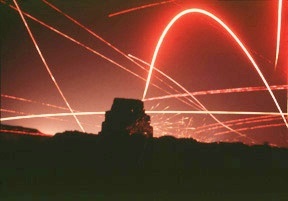 April 1984. Reza, an Azerbaijani, was born in Tabriz (Iran) in 1952. He is a member of the new breed of photojournalists that emerged after the Vietnam war. His photos are known for their naturalness, capturing moments of stark reality and harshness. His body bears the scars of a courageous cameraman-a shrapnel wound from Iran, a deep gash across his skull from the Philippines, a nose that has been broken several times, so many episodes with tear gas that he's stopped counting and even lung damage from phosphorus bombs that were dropped on Lebanese women and children. Reza prides himself on having covered all of the conflicts and wars in the Middle East since 1978 except for Chechnya; at the time he was on a humanitarian assignment in Afghanistan distributing aid. His portfolio includes the Iranian Revolution, Iran-Iraq War, Beirut, Afghanistan, Sarajevo, the Berlin Wall, Rwanda, Burundi, South Africa, Tunis, Jerusalem, the departure of Marcos from the Philippines, Black January in Baku and the horrors of the Karabakh War between Azerbaijanis and Armenians. His passports bear the stamps of 85 different countries. Left: Manila, Philippines - The empty chair of President Ferdinand Marcos who was so sick that he had to go backstage every few minutes to consult with his doctor. Imelda, his wife, waits with a security officer. It was one of her last public appearances. 1986. Right: Tripole, Lebanon - Rockets stored in the trenches at Camp Badaoui, December 1983. Though professionally trained in architecture at the University of Tehran, his photographic skills are self-taught. Reza points to a day in the spring of 1978 as the turning point in his professional life. He was working in an architect's studio in Tehran at the time. His office on the second floor looked out over the street. Suddenly, the street below filled with university students chanting, "Death to the Shah." Those were early days; the Shah's troubles had not really begun. Reza watched from his window. Five minutes later, army jeeps appeared from both directions on the street and trapped the students between them. Rounds of shots fired out. Students fell; some were killed, others wounded. 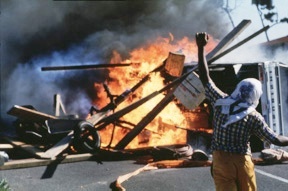 Left: Riots in South Africa, 1985. Right: Kabul, Afghanistan - The first attack by Afghan Mujahedins on the city of Kabul. May 1983. Reza fixed his eyes on one of the students who had a camera and was running all over the place taking pictures. Then the student disappeared as well. The demonstration occurred around 3 p.m. Reza continued to look out the window, transfixed by the events that had unfolded right in front of his eyes. "I asked myself, 'Who am I?' 'What am I doing with my life?' 'What is going to happen in my country?'" Three hours later, when everyone was getting ready to go home, he had made up his mind. He turned in his key and told his friends, "Tomorrow, I won't be working as an architect." His colleagues wondered where he was going. "Are you off on vacation?" they asked. "No, I'm going to take pictures." Reza soon found himself in the streets of Tehran, photographing the movement to overthrow the Shah of Iran. It wasn't long before he met some of the world's best photojournalists-heavyweights like Englishman Don McCallin and Frenchman Mark Riboud. He made friends with them, and soon they were curious to see some of his work. "I'm an architect. I just take photos as a hobby," he told them, hesitant to show his work. Not long afterward, his photos were on their way to Paris to SIPA, one of the world's major photo syndicates. SIPA has a distribution network to 2,000 magazines and newspapers throughout the world. The word soon came back. "Congratulations, Reza! You've just had six pages published in Paris Match, six in Stern and one in Newsweek. Besides, the Newsweek guys are interested in meeting you!" And so it was that from 1978 to 1983, Reza worked for Newsweek, covering the Iranian Revolution (1979) and the American Hostage Crisis in Iran (1980). In 1981, while covering the Iran-Iraq War in Abadan (Iran), he got hit by shrapnel and was evacuated to Paris to be placed under the care of one of the best surgeons there. Soon he was on the road to recovery. In 1982, assignments took him to Beirut to cover what Israeli soldiers were calling "Peace for Galilee." More than 15,000 people were killed there. Again, he was wounded. This time his lungs were burned by a phosphorus bomb-forbidden by international law-that the Israelis were using. When the bombs hit, the gas penetrated the basements where the women and children were hiding. "When you inhale or try to breathe, it burns your lungs," said Reza, remembering the feelings of suffocation that he suffered from for so long. This time, the doctors prescribed pure mountain oxygen as a cure. Where could a photojournalist go to get such an adequate dosage of fresh air? Afghanistan, of course. The Afghan guerrilla resistance movement against the Soviets was in progress. For the next five years (1983-1988), Reza hung out with Afghan guerrillas in the mountains of Afghanistan and Pakistan, trekking beside them for more than 5,000 kilometers. "We would hide in the daytime and walk at night," Reza recalls. He tried to look like them and dress like them. Communicating with the guerrillas was easy, since Persian and Afghani are so closely related. "It was really tough living on nothing," Reza remembered. "Once we went 14 days without eating anything except for leaves. You have to have something in your stomach when you walk. So we drank river water and ate leaves. The Afghans knew which ones were edible." 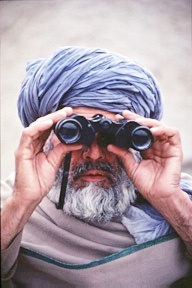 In 1983, Reza's coverage of Afghanistan was published in Time Magazine, Stern and Paris Match along with 30 other different publications throughout the world. It was big news, since there had been a virtual blackout of all news by the Soviets. 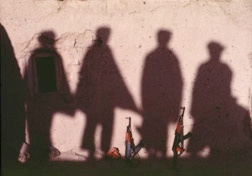 For his coverage in Afghanistan, Reza was awarded Second Prize (1983) for the "Best Photojournalism for an Event" by World Press Photo. He describes this as an equivalent to the Pulitzer Prize for world photography. His younger brother, Manoocher, working with France Press, took First Place that year for his work covering the Iran-Iraq war. His work appeared in Life, Time and Newsweek. Reza went on to win the Second Prize again in 1986 for his work in Pakistan covering the struggle of Benaziz Bhutto challenging President Zia-ul-haq in her election campaign. Reza's assignments have taken him to Tripoli (Syria), to Yemen by boat with Arafat, Tunisia, Kenya, South Africa, Egypt, Rwanda, Burundi, the Philippines for the election of Aquino and the departure of Ferdinand Marcos and Sarajevo. Then came Black January in Baku (1990) when Soviet troops descended with tanks and killed hundreds of civilians in an effort to crush the independence movement in Azerbaijan. (See story in this issue - Black January). This was followed by Karabakh. Most recently, he has been on assignment with National Geographic to cover the five countries of the Caspian region-Azerbaijan, Iran, Turkmenistan, Kazakhstan and Russia. This is his seventh assignment for National Geographic since he started with them in 1991. Reza is after what photojournalists call the "decisive moment" - the instant of truth that contains the essence of the event. "You have to know the moment when the real action is happening," he explains. "It only happens once. You have to train yourself to be able to catch it." Reza's criteria for undertaking any assignment is that it must help him document the efforts of people everywhere in their quest for 'haq' and 'azadlig' (justice and freedom). "Freedom and justice are the real pillars upon which you build any society," he says. "Eventually, they lead to democracy and away from horror." Reza uses his camera to tell a story. "I use my camera as a pen. Light is my ink. The film is the page I use to record the deep message I'm trying to convey." When given an assignment, Reza does his best to research the region as thoroughly as possible before he arrives on the scene. "It might mean that I watch a documentary or a movie, or read a novel or even a book about history or philosophy. On my last assignment, I read 80 books. I'm always in search of the 'perfume' and the soul of the people - in an effort to understand what is going on." When he arrives at a new location, he usually spends time getting to know the place and people before taking out his camera. Reza doesn't pose his subjects-except when during portrait work. He concentrates on making people feel so comfortable that they forget his presence. "You have to become like dust under their feet-as if you aren't there. You can't be an intrusion on their everyday affairs," he explains. Despite all of the horror and blood that Reza has seen on the front lines of conflicts and independence movements these past few decades, he is still optimistic and believes that the world is becoming a better place: "I believe an evolution is occurring. That there is more understanding between people. More distribution of health and wealth. That's why I'm optimistic. My task is to convey this message." He compares the various worlds that he lives in - Paris and Washington - to the Titanic. "We're living on a big ship during the best of times. We're enjoying grand parties, great food, wonderful friends and privacy. But all around this ship is blood and famine and disaster. I feel like I'm one of those people living on that ship and from time to time, I slip into the water. After a while I return and try to explain, 'Hey, there are people out there who are dying. We should do something about it.' And when I see that people aren't taking me seriously, I remind them of what happened on the Titanic. One day if we don't take care of those in the deep, dark, icy waters, it could happen to us."